2019 Classes and Events Calendar is now out! In the winter/spring/summer, we are “on location” at a variety of venues throughout the southeast including the Grovewood Gallery during the Arts & Crafts Conference, The American Craft Council Atlanta Show, Sawtooth School for Visual Arts in Winston-Salem, & Arrowmont School of Arts & Crafts in Gatlinburg. WE ARE AN OFFICIAL EDUCATION CENTER OF THE SOUTHERN HIGHLAND CRAFT GUILD! Low-Cost workshops include a detailed demonstration followed by hands-on practice as time permits. Available for laced cane and rush seats. Ideal for people on a time/money budget. $25 off a full-day class as a graduate of the workshop. Bring your project chair for tips on getting started at the end of the workshop. 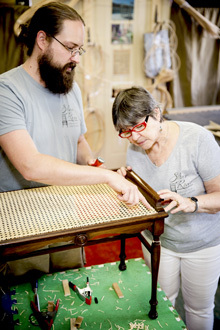 Learn Splint, Rush, Shaker tape, Laced Caning, and Pressed Caning in a structured class where you will finish a chair project. Bring your own chairs, or we can provide them for you for a nominal fee. Tuition includes all tools and materials, after-class assistance with future projects, and $25 off future classes. A two-week intensive geared toward beginners but also great for perfecting/expanding the skills of an intermediate seat weaver. A total of 5 chairs will be woven in each style: Laced Cane, Pressed Cane, Shaker Tape, Fiber Rush and Splint Reed restorations. Learn invaluable tips to simplify the process, some history, and business skills. Save $150 by signing up for boot camp. Take all 5 classes within 1 year and still get the discount. Bring a friend and get an additional $100 off…for each of you! Anyone can attend individual BOOT CAMP classes without registering for the entire two weeks. Schedule a tutorial in 1-hour increments for a little more help with your project, or if your chair exceeds the scope of our classes. Materials are not included in the cost. We are glad to order materials for you. You are welcome to stay and work in the shop and work independently after the tutorial. Tutorials are $40/hour by appointment only. Call 828-707-4553 to schedule. Chair caning is physically demanding work. If you are injured, please let us repair your chair for you. Wait until injuries have healed before taking a chair caning class. Parking is available in 3 spaces in front of the garden. Street parking is close-by. If you don’t have a chair, we can pick one up for you for $10-$40, depending on the chair. Please let us know when you sign up so we can find a chair. You do not need to bring tools to class. You may check out our tools for homework assignments (with a cash deposit or credit card number and signed permission that we can charge that number if you lose or break our tools). If you have your own cane/rush/reed, and it has passed our inspection, we will discount your class cost in the amount of your materials. Please save the receipt. For individual tutorials, you provide your own materials. We provide a list of caning suppliers for future projects. Comfortable clothing and shoes. We teach standing on anti-fatigue mats but you can also sit down. You are working with fibrous plant materials and sharp tools that may pick clothing. We have great heat in the winter but do not have AC for the summer. Dress accordingly. What type of chair is easiest to learn? Splint and Shaker Tape are the quickest, least complicated classes, followed by machine-woven caning, and rush weaving. Laced caning takes 5 days of physical and mental work. Our golden retriever Rosie loves to come to work but generally doesn’t come in on a busy class day. If you are allergic, please let us know so we can clean the shop really well. Bathrooms are on-site. Bring your own lunch or snacks and store it in our refrigerator, or go to a River Arts District cafe. We have all plates/napkins/utensils/cups/water/tea available for you. $25 discount on each class that you take after the first one. Bring a friend, you get $25 off. Buy a 5 class package (Boot Camp) and save $150 or attend Boot Camp with a friend and save an additional $100 each. 5o% down payment to hold your space. Full refund with 48 hours notice. 24 hours notice of cancellation results in a 50% of deposit returned (exclusions may be considered based on situation). No show/no reschedule/no refund. Rescheduling for classes allowed at $25/class in most circumstances. If you live out of town, call to determine if you have a suitable chair for the class. Send an email with photos. You may need measuring tape. You may need to remove your old seat. THIS IS IMPORTANT so that we get the right material for your chair. If you are local, stop by. Bring in your chair a week in advance so we can inspect it. Structural Repair must be done before you install the seat. Refinishing of the chair should be done before you weave the seat. Save your old seat if you want to match a specific material/pattern/color. Some chairs can’t be TOTALLY finished in a day…Rush and Splint chairs must dry over night and then get a shellac coating to protect them from stains. We can do this for you, we can send you home with instructions, or you can come back in the next day to shellac your chair. It will only take about an hour which includes enough time for the shellac to dry enough for you to take the chair home. A signed waiver is required for participation in any of our workshops. If you have financial need and are willing to work for us for trade of class cost, we will consider based on each situation.